About Us - Kaufman's Auto Repair Inc.
Mo"Ready to serve the needs of our drivers and vehicle owners with quality, honesty, and integrity"
Roger Kaufman first opened Kaufman's Auto Repair Inc. in Sarasota, FL in September of 2009. 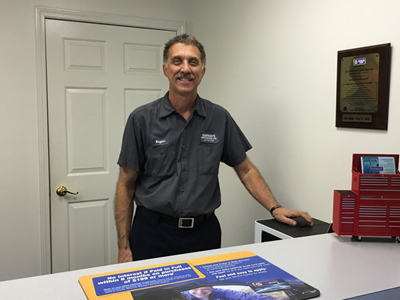 Before he opened his own auto repair shop, Roger had 31 years of dealership experience. Then, he purchased this business and took it over. Over the years, Kaufman's Auto Repair Inc. has grown from a 3-bay shop to a 6-bay shop. The shop started with just 2 employees and now the staff consists of 6 employees, ready to help customers with anything related to auto repair and maintenance. The main reason why Roger decided to choose auto repair as his profession is because he likes the challenge of diagnosing issues for today's vehicles. Today, Kaufman's Auto Repair Inc. offers top-notch auto repair and maintenance services to the residents of Sarasota and surrounding communities. We have a team of ASE, technicians who perform various repairs and services, specializing in A/C and brake repair. They use only the latest diagnostic tools and equipment when they are working on domestic or foreign vehicles. Our technicians are constantly improving their auto repair knowledge with regular training in order to deliver the highest possible level of customer service. We are a recognized NAPA Auto Care Center that works closely with Jasper, offering top-quality Jasper transmission and engines. We strive to have 100% customer satisfaction by repairing customer's vehicle right the first time and in a timely manner offering a great warranty to back up our work. Many repairs have a 24 month/24,000 mile nationwide warranty. We are the service team you can trust when it comes to auto repair in Sarasota. Give us a call or schedule an appointment online to visit our clean and professional auto repair shop!